MANILA, Philippines - The movie "Miracle In Cell No. 7," which stars Ryoo Seung-ryong, Park Shin Hye and child actress Gal So-won, sold 12,320,000 tickets to become the third most viewed Korean film of all time. According to the Korean Film Council, "Miracle In Cell No. 7" achieved the feat last March 15 and surpassed the movie "Masquerade," which has 12,319,542 in admissions. Incidentally, Ryoo Seung-ryong is also in "Masquerade," a movie headlined by Lee Byung-hun. "Miracle in Cell No. 7" was released last Jan. 23 in Korea and in just 32 days, it breached the 10-million ticket mark. "'Miracle in Cell No. 7' became the first film of the comedy genre to surpass the 10 million mark 32 days after its release due to the long lunar new year holidays and families going to see it in groups," according to the Korean Film Biz Zone (KOBIZ). It said the movie was popular among middle-aged and elderly Koreans. "Miracle in Cell No. 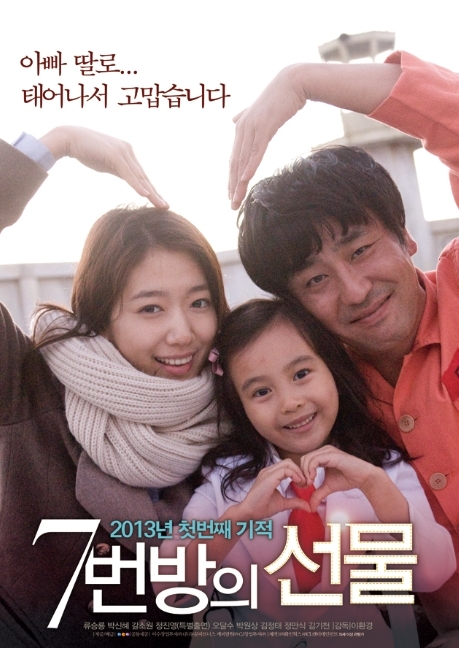 7" is a story about Yong-Goo (Ryoo Seung-ryong), a mentally challenged man, who was imprisoned for murder, and his daughter Ye-Seung (played by Gal So-won as a child and Park Shin Hye as an adult). His cellmates help him to sneak in Ye-Seung. To date, the movie has sold 12.55 million tickets and grossed 89,657,000,000 won ($80 million or P3.27 billion) in the box office. If "Miracle in Cell No. 7" continues to do well, it may surpass the Top 2 most viewed Korean films of all time, "The Host" and "The Thieves." "The Host" was released in 2006 and has 13 million in admissions. "The Thieves," which starred Kim Yun-seok, Kim Hye-soo and Kim Soo-hyun, was released in 2012 and has sold 12.98 million tickets. For films released since January this year, "Miracle In Cell No. 7" is No. 1 in the box office followed by "The Berlin File," "New World," "Man On The Edge," "The Tower," "Les Miserables," "Life of Pi," "A Good Day To Die Hard," "Jack The Giant Slayer" and "Pororo: The Racing Adventure," according to KOBIZ. "Miracle In Cell No. 7" was shown at the Berlin International Film Festival last month. It will be shown in Japan, Hong Kong, Thailand and Taiwan. Park Shin Hye, who recently held a fan meeting in Manila, will be starring in the film "Rock, Paper, Scissors of Love," scheduled to be released in May.